And ignore the guy in the background. He's like that camera man you see when the real mythbusters switch camera angles. 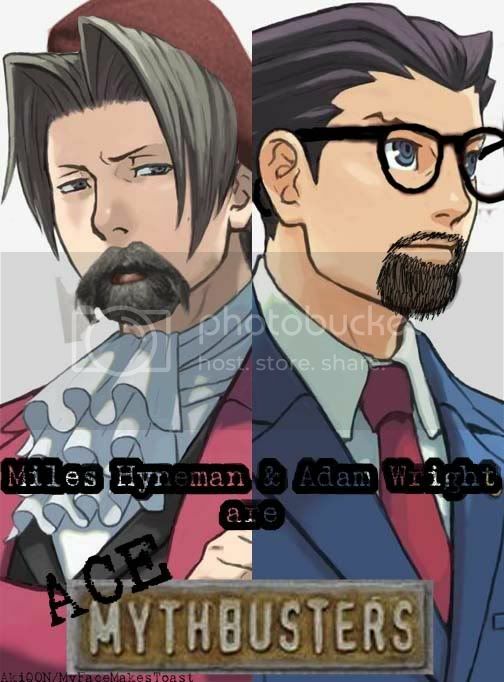 Meet the Mythbusters: Miles Hyneman Edgeworth and Adam Phoenix Wright! They don't just tell the myths! They fight over it in court! They put them to the test! They parody them mercilessly! Part 2... of Part 6? O_o Not again! Mythbusters and the some of the background images(c)M5 Industries and the Discovery Channel? Last edited by Android 21 3/7 on Wed May 27, 2009 10:17 pm, edited 25 times in total. Edgeworth and Gumshoe made me laugh real hard. I hope to see more of this and... Have more blueprints, they're the best! There's only one thing I can think of to make this more awesome. Ace Mythbusters Asks a Ninja. That was one hilarious webisode, wasn't it? Unfortunately, I don't think I can do that. Not unless someone makes a set of Nickel Samurai or Jammin' Ninja sprites. Last edited by Android 21 3/7 on Tue May 15, 2007 12:38 am, edited 1 time in total. Interesting concept (I liked it, and laughed)...I would like to see more of this comic when you get around to it. Oh man, you and Toast have the best sense of humor, you know that? Being a fan of Mythbusters and PW, this comic made me laugh out loud. Good work. Sweet! And I love Edgeworth's hat! I can't wait to see more! Please, Do More! Don't make Larry beg! 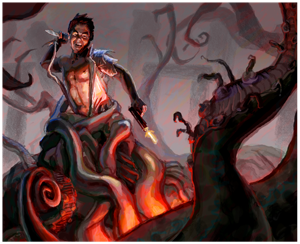 Part 2 (both parts of part 2 O_o) are up for your enjoyment! This has quickly become one of my favorite comics! And I don't even watch Mythbusters! I wanna see Dancing Blue Badgers blown up! Blown him up, woohoo! Man, I just love the way you used Will and Gant in these. I can't wait for the next parts! Man! You and Toast have some of the greatest sense of humor! I loved how you put Powers and Gant into part 2 part 1 and part 2 part 2 (getting a headache from the confusion!) Can't wait to see the rest of it! Gotta see them blow up the blue badger! This is cute. I look forward to more. 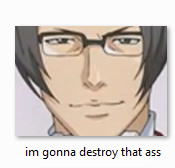 Someone suing Edgey? I haven't seen the show, but whoever this Jamie is, he's royally screwed. Edgey: --which completely throws away the entire testament to mediocrity that was your fingerprint theory! Udgey: I find the... erm, guy without a hat guilty of fourth-degree murder, arson, high treason, obstruction of justice, public indecency, insubordination and falsified evidence. Court adjourned! I don't think Jamie would do that. Jamie: You stole my hat. Jamie: What's more, you dyed it pink. Edgeworth: I did not steal your hat and for your information, the color of this hat is wine! Edgeworth: For the last time, I never took your hat! Jamie: Riiight. And WE didn't just steal your car! Adam: :D SWEET RIDE! PERFECT FOR OUR "CAN YOU ESCAPE FROM A SINKING CAR" MYTH! Lol! I could so see that happen! You know what, they should just forget world famous myths and start making up their own! 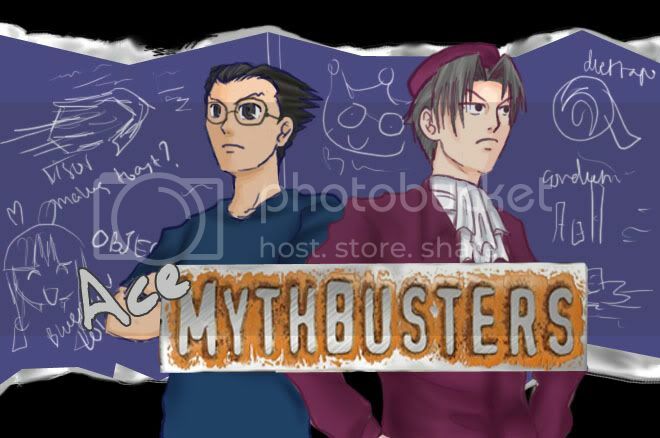 Edgeworth: Now for our next myth. Is it possible for a good defense attorney with a decent paycheck and swell life to become a hobo in 7 years time? Lets test this out right now! Wright! Quit your job! Phoenix: Sure thing! Just as long as I'm getting paid for this! Last edited by dullahan1 on Wed May 16, 2007 2:04 am, edited 1 time in total. And that's how I became a hobo! GET THE F*** OUT OF MY HOUSE! Ninja - You should have gone after the real Ninja myths. The stuff that people think is true. Ninja - Like vengeful spirits of you Ex-Girlfriend are defeated with a simple exorcism. Ninja - You'd think that, but they're not. I look forward to reading that crossover soon. HI-YEAH!!! Yeah..I really doubt I'll be doing that. I find PW sprites way too hard to edit, and I don't really like doing it. 2. If I gave Edgey a mustache, I'd have to give Nick one too. 3. And both of them glasses. 4. 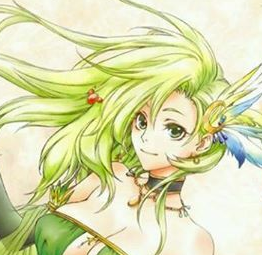 And make Phoenix slightly balding. Part 3 is up! Sorry it's so short. I'll try and get to work on the next one. Edit: I forgot to mention. Toast did the blueprint for Part 3! I can't! D: *throws hissy fit* For the reasons listed above. Last edited by Android 21 3/7 on Sat May 19, 2007 1:37 am, edited 1 time in total. Yes! The new issue is of win! And hooray for more blueprints! So random and funny! Godot's visor=very explody! LOL! I'm seriously loving these! You and Toast are freaking geniuses! You both rock so you both get a cookie! Actually, this is probably his biggest break yet considering that he doesn't to wear a mask to be on TV this time. Excellent Stuff, Android and Aki! I just loves Pearl's line in this one! 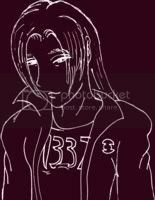 Aw Pearly, you're so cute..you could advocate mass anarchy and make it A-OK.
XD AKI(Toast) MADE A COVER IMAGE! It makes be giggle!